A few days before the special night, here is my last 2018 NBA Mock draft, a draft which will be remembered for its incredible group of big men and potential wing superstars Doncic and Porter (click on the name for player’s profile). A lot of teams have cooled off about Doncic, who was a bit exposed during the Final Four. 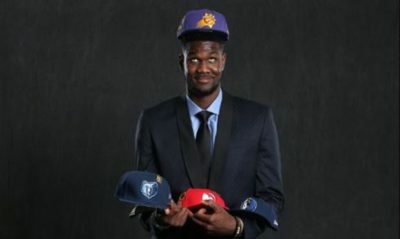 Ayton seems to be definitely the pick there. Even with Kokoskov’s relationship with the Slovenian prodigy, passing on Ayton seems pretty impossible. Sacramento has to fill two spots at SF and PF. Doncic could still be the pick there, but him and Bogdanovic would not be the most complementary pair. To me, Bamba may be the prospect with the biggest upside and could form a nice pair with WCS. What about trading this pick to the Celtics? Boston seems more and more interested in Bamba since his Combine measurements and willing to trade up. As I said several times on twitter, Brown could be the trading piece. A very interesting recruit for the Kings, Brown would bring much needed offense and defense on the wing and went to college (only for one year I know) less than an hour from Sac-Town. Like other teams picking in the top 4, the Hawks may go with the best big man available and give up on Doncic. After Ayton and Bamba, Jackson seems to be the one with the most upside, being a better defender and shooter than Bagley. The Spartan has to gain maturity and consistency but would form a nice pair with Collins. With Ayton, Bagley has been the most dominant inside player this year. The Duke freshman still has room to improve on his shooting and above all defense. He may be the safest pick but lacks Ayton or Bamba’s length. Memphis needs an offensive threat inside and Bagley would fit perfectly to improve their roster. With the top big men gone, Dallas could opt for Doncic, whose talent and maturity are undeniable. Once again, his relative lack of athleticism could make him slip a bit and Dallas could go for Carter, a hard nosed and versatile center, or Porter, if he shows that his athleticism is back. Trae Young was tired at the end of season, but is it exceptional for a freshman who played 35min per game? Young had one of the most incredible season ever with 27pts and 8.7as, let alone for a freshman. Orlando gave up their starting PG and may need a catalyser for their young guns. Young may be this guy and try to emulate Stephen Curry. Rebounding, defense, shooting, Carter is a versatile player who fits well the new mold of centers. He didn’t have a good Tournament with 0 3pt made and only 2rbds in the loss against Kansas. Yet, at the 7th spot, he would complement well with Markannen and he’s as good inside as he’s from outside. If Porter Jr shows that his athleticism is back, he will probably be Chicago’s pick as Lopez still can do the job at center. The Cavs’ roster is full of outside players but with the seven clear best prospects gone, Cleveland would have to go with Porter Jr. Michael Porter Jr’s stock is still high, but I haven’t seen enough to put him in the top five. He has just played 53min this year and may need some time to get back to his old athleticism. Yet, he was the top high school player last year and a potential star at the small forward spot. He allegedly was pretty good in the workouts but he’s injury prone and that is a major red flag to pick him higher. What the Knicks lack is a consistent small forward and Kevin Knox may be that guy. A bit raw, Knox has to improve on many fields like his shooting consistency, passing or being a more efficient defender. He measured very well at the Combine and that may help the Knicks take a decision. The Sixers may go local with Mikal Bridges. The Villanova swingman brings versatility, shooting and defense to a revamped Sixers team. He still has work to do on his handling but fits well alongside Fultz and Simmons. If he’s not available, Philly could choose Gilgeous-Alexander to bring even more versatility. Whether Walker stays or not, Gilgeous Alexander could be the backcourt future for the Hornets. The Canadian kid was not the most hyped Kentucky recruit but has risen to be the most important player, helping the Wildcats have a positive season. Gilgeous Alexander is a good defender and passer and has improved on his shooting. He has poise beyond the years and should adapt well to the League. He could form a very efficient combo with his better scoring co-alumni Malik Monk. The Clippers may pick another Texas A&M alumni if DeAndre Jordan leaves. Williams has incredible body and athleticism. He was one of the best defender in the NCAA with more than 9rbds and 2blks in only 25min and may bring more toughness to the Clippers. He has to work on his IQ and outside shooting to be even more efficient but fits the modern running C a la Capela. I’m not a fan of Sexton. I confess he has heart but is a bit of a ball hog and doesn’t have elite size or athleticism for the League. The Clippers may need another promising PG alongside the aging Teodosic. Sexton could be a good complement if he learns the nuances of the game behind the Serbian vet. Bridges is not an academic player. He didn’t measure very well at the Combine, has a low release, could improve his handling, but at the end of the day, he brings shooting, athleticism, even passing and could be a glue guy for the Nuggets to complement Jokic. Mitchell Robinson is the unknown prospect of this draft. Since his senior season of high school last year, he hasn’t played, decommitting from Western Kentucky in the process. Yet, in high school, he was one of the top centers in the nation with very good running and leaping ability for someone his size. The small footage of workouts available show tremendous size and athleticism. He could learn the game from Gortat and be Washington’s future rim protector. The French combo guard was flying under the radar but since the last mock draft, he had his coming out party with a 44pts playoff game against French championship leader Monaco. At 6-3 with a 6-7 wingspan and good athleticism, he has played as the primary ball handler in the tough French championship, adapting very well to his new position, while improving on his shooting and passing (4.8as, 39% 3pt). He could form a very interesting pair with Booker, bringing good size and much needed outside scoring at the PG spot. Despite his upside as an athletic shooting guard, Walker has a lot of work to do on his shooting and consistency. He’s far from being a complete combo guard now and could have been a top 10 pick with one more year of work. I can’t deny he has some very interesting tools and seems to be a smart kid. He will have room to improve with the Bucks, unsatisfied with Tony Snell’s poor performance in the playoffs. The Spurs have many needs but in this mid/late first, SGs are the most talented prospects. Smith is a local kid who has shown great toughness, savvy and an improving outside shot. He would form an incredible defensive pair with Murray to help the Spurs rebuild their backcourt. With Donovan Mitchell’s success, undersized SG with wingspan and defensive ability are trendy. This is exactly what Thomas, a two-way SG who can shoot and defend hard could bring to the table for a poor defensive Hawks team. Brown brings versatility in a team that has his starting Five set (if no one leaves). He measured well at the Combine at 6-7 with a 6-10 wingspan. Like Chicago’s own Evan Turner, Brown is not the most athletic or the best shooting player but has poise beyond the years and is a very good rebounder for his size. After a promising season, the Jazz could be interested in an inside player who can spread the floor. Spellman, despite being 21, was very efficient as a freshman and, above all, is exactly what the NBA teams are searching as a shot blocking/rebounding/shooting big man (8rbds 1.5blk 43% from three). Apparently, Hutchinson got a promise from the Bulls. He’s not my favourite prospect as, despite being a senior, he wasn’t that much of a shooter (36% with 4 attempts per game) and is a good but not exceptional defender. DiVincenzo had a very interesting Combine where he measured a top 42 inches vertical leap. He also show good defensive activity during the scrimmages. While he’s not a completely ready combo, he could see minutes at the two spot and works on being more of a PG in the coming years. Another late riser, Huerter had a very interesting sophomore season with Maryland, displaying very good outside shooting (42% from three with 5 attempts per game) and versatility (5rbds 3.4as). He may not be the longest swingman but would be bring more size to the Blazers’ backcourt. The Lakers gave up their first round pick to the Sixers and, as they will be trying to sign a a star or two this summer, they may go with the most promising player. Simons decided to skip college to focus on his game at IMG Academy. The young guard has impressive athleticism and shooting, despite a low release point. He still has work to do on his handling and will have to adapt to NBA’s toughness. He’s a good fit alongside Ball and has the potential to become a top scorer. A local hero, Brunson is a more talented prospect than McConnell. He is exactly the type of player Philly loves, a mature, poised leader who has been successful in his college career, both collectively and individually. Despite his lack of size and athleticism, Brunson was one of the most efficient player on offense in the whole NCAA and is set to have a long carrer in the League. A late riser, the BC alumni brings elite shooting. He could be a nice scoring option from the bench while working on hsi playmaking skills as he lacks elite size and strength. I know there are few chances his name is called that early, but the Bosnian, despite not being as mainstream as other PF prospects like Wagner, offers a combination of defense, passing and developing shooting that are worth the risk as a late first rounder. His last game against WVU with 18pts 6rbds 6as with 2/2 from three is a good illustration of what the collegiate top shot blocker can do. Landry Shamet could be the pick there. Contrary to other PG prospects like Duval or Carr, Shamet doesn’t have a major weakness. He’s a very solid shooter and passer who will have to adjust to the speed and strength of NBA point guards. With Schröder set to leave during this offseason, Atlanta could look for a new PG to lead its team. Aaron Holiday is a very talented PG who can score in bunches. He’s not the tallest PG but compensates with a 6-7 winsgman and very good speed. He still needs to work on being a more poised PG and cut down his turnovers but has the talent and genes to last in the League.